okay please take it easy on me. i know this is probably a newbie question. i got my boss fix powder today. it will be almost impossible for me to sprinkle it in my boss's office. if anyone has had success with an alternate form of deployment please tell me. Do you know where your boss parks his/her car? You could toss some on the ground by the driver's side door so he/she'll step in it. That could actually work on the right day with the right timing. Any more suggestions anyone ? Lightly dust your hands and shake hands or pat him on the back. So my work situation is thus that I don't see my bosses (I have 2) very often in person: I work "on the road". Things were really tense in our company due to the launch of a new computer program that was driving everyone BANANAS, and the stress was crazy. My immediate supervisor M. was especially showing it; everytime I went into the office, even other co-workers were saying to me "It's getting hard to work around her." She and I started having miscommunication, arguments, and snippy voicemails/emails back and forth. I decided that enough was enough, and decided to lay my first Sneaky Trick(tm). I got a small bath kit, containing bath and shower gel, lotion and a pouf, in a plastic container. I added a couple drops of Boss Fix oil to each liquid and shook them up well, petitioning that I would be M.'s most favorite employee and she and I would have a great working relationship. I dusted Boss Fix sachet powder on the outside of the bag, making the same petition. I then took a greeting card and wrote to her, saying she'd been sounding so stressed that she might like a little pick-me-up. I dusted this card and envelope with Boss Fix powder, making my petition again. I mailed everything to her office. Within a week, her messages on my voice mail were much kinder. She wasn't sarcastic anymore. And two days ago, she even noted a compliment one of our clients gave me, and passed that compliment on to *our* boss so I could be recognized! Re: Boss Fix sneaky trick: working well! Harrrrd! Lol So today U had a job interview and added a few drops of boss fix oil to my hand lotion and also to my hands so that when I met with the hiring manager and future boss I would shaker her hand with my fixed hand...Once thing I noticed that everyone that was interviewed before me stayed in her office no more than five minuets.When she finally got to me and shook my hand she seemed to open up a bit more and we actually spoke for almost an hour in her office! I got home and burned some more steady work incense and took a nap and I awoke to a message from her inviting me back for a second interview!YEY LUCKY MOJO! Great and good luck MightyScorpio...its seems you got the job! Thanks for the post...it gives doubters some positive reference points. I am so excited about this you have no idea! Well...I'm sure you do lol. It's so funny because my mentor who opened me up to Lucky Mojo products almost six years ago said she had a aunt who would use these products in her hoodoo workings and got what ever she wanted like really what ever she wanted. From the mansion to the rich husband, money everything but when people hear stories like that they think it's like the snap of a finger and BAM there is is...Not true, I feel like my intent and discipline in doing the work right and not cutting corners is what pushed it over the top because I really wanted this job and I got it! YEY! I have a very moody manger ( read capricious) who will switch our schedules around like we dont have a life..sometimes i accomodate, but sometimes i cant. So this last time when she pulled a switcheroo on me, it happened to collide with some critical out of town plans...so i walked up to her office with boss fix powder on my hands hoping to trick her office with it somehow..shot in the dark, well she was in there and i put my hand on the back of her chair, and put a great deal of it on it..well when she leaned back allof it rubbed on her neck and hair...she agreed to reversing my switch ASAP and gave me a day off ...hee hee...ofcourse before going in i had done the 'real world' stuff like puttin in the right application for a day off etc etc...but she is notorious for never giving any days off...another thing i absolutely believe in : dont share this with colleagues, u dont necessarily want to draw attention to yr good luck when using hoodoo/conjure/LM products...oh and this job itself, i got it with using LM products, and its going great so far!!! See now this is what I'm talking about zee I love to hear stories like this=) It's so crazy how good their products are because my candle went out last night and I'm still getting call backs for interviews . I take this as a sign to explore all the options that come my way because they just seem to be getting better! In my next order I will include the rest of the boss fix line...I will keep that tip about the attention, I was just so excited to leave my review with such a great outcome. I'm new to the forum, and have been using Lucky Mojo products for a few years now. I have been fixing notes from my boss with Boss Fix powder, and placing them in my left shoe so that I've got them under my feet. After a couple of days, the paper gets worn out and I end up having to replace it. Would fixing the paper, laminating it, and then dusting it again once a week work for this spell? Welcome to the forum thescribe. I would dust the bosses office with the powders for s/he to come in contact with it instead of laminating. I'm dusting the office once a week as well, which has worked very nicely. Thank you for the advice! I think I'll switch to only having the note in my shoe for specific situations. Hi i am also new to hoodoo, i have never cast a spell, but i want to have one done on my boss, ( i have 2 ), i just started a new job and want for it to be long term, and to be the one in control of things. Is there anyone who know of a really good spell that i can use? Hello!! I just received my Boss Fix Powder from LM. I don't have a bad relationship with my boss as she is new but I know people is in her ear. I have ample access to my boss's office and I can get in there alone pretty much everyday if need be. 1) How should I use the Boss Fix powder in her office? 2) How exactly will Boss Fix help me? Also, I am headed to an interview. 3) How can I use boss fix in that situation? Should I sprinkle some on my hands and say a prayer while doing it, like "this job is mine" etc. ? 1) See the web page on how to use powders -- Http://luckymojo.com/powders.html -- they work well on papers or, if mixed with dirt to soften the colour to a natural shade, they can be worked into carpets, potted plants, and so forth. 2) It will bring your boss to help rather than fight you, to support rather than oppose you, to listen to you rather than others. 3) That's a good idea. See http://luckymojo.com/bossfix.html for more suggestions. Hi I would like to know if this will work, recently the people in authority are pretty much getting annoying, I understand I have made mistakes but I'm a busy person and I do my best and never get lazy and they know this but still the disgusting behaviour towards me...so I was thinking of just pouring a whole line outside their office because the floor is cream so it would blend in plus know one else would get their feet on it other then the authority workers so should this work....I wondering is this a good intent...May all these bosses treat me with respect. Is that enough? should be right? What's the worse thing that cold possibly happen? That it doesn't work? No big deal, right? If this is the best that you can do for now, then do it! I used Boss Fix sachet powder when I first started my job. My boss was rather prickly and impatient towards me since I was new to the job. At times, I felt like I just wanted to get away from him, as well as the job. 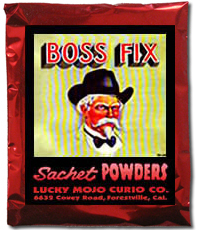 Enter Boss Fix sachet powder - I powdered his truck door, as well as his jacket with Boss Fix powder (bold, I know). Within two weeks, he developed shingles as well as a mellower personality towards me. Now I'm at the end of my job, and he's treating me WAY better to the point where it's almost like we're chums. I did use some candles to influence him, but I think Boss Fix was the game changer. It didn't work in a flash, but it really hit the mark over time. I get along very well with my boss. Unfortunately over the last year I've had a few issues with another employee and today finally, things turned sour. I saw my boss about the incident, although she was understanding, she appeared a bit fed up with the situation. I have boss fix powder. I was thinking of getting to work early and dusting her door knob etc so as to try and keep her on my side as she has been so far. Should I mix my LM stop gossip powder in and use that in mine and the other employee's office too? Any suggestions would be appreciated. Thanks. If you think these people are gossiping about you, then sure, use the Stop Gossip powder too. However, be sure to mix the powder with a little dirt to turn it a more neutral color; that powder will really stand out against dark carpet. I'd also suggest that you get a reading on this situation. Tricky stuff in the workplace is no joke; you want to know how to nip that stuff in the bud.